Great communication and dispatch was next day, well done guys! My new fi-7160 replaced my 12-year-old Fujitsu fi-5120 which still works but was replaced due to a driver conflict with a newly installed printer. My, how things have improved. The speed is incredible and I no longer have to be super careful when feeding a stack of documents to avoid jams or multiple sheets being pulled through together. 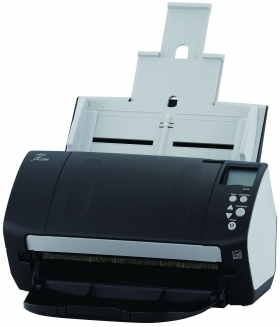 Great little machine that scans huge amount of paper so quickly, both sides so minimal effort. We have a huge number of files to scan in the office (archive) and every day an office junior scans around 1k pages for an hour or so. Good customer service, knowledgeable and quick delivery. The even register the product for you for the warranty! Having used this product at work, I purchased it for my home office use as it does a very effective job and at speed. Very happy with it. We have more than 10 of this device. Fast and reliable. Easy software installation with good customization options and regular updates. Not cheap but you get value for the money. Easy to setup, very fast scanning and a nice size. Installation screens could be a bit better laid out, but this is the only negative. The fi-7160 has been introduced to support increasingly diverse business related document capture routines at the desktop of individual knowledge workers or small workgroups. 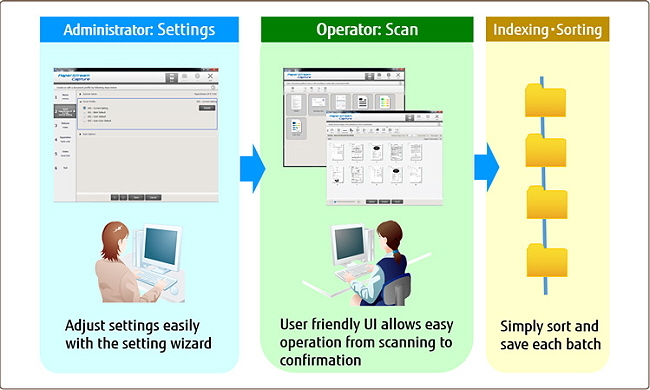 Simple, productivity-boosting operation virtually eliminates training requirements, both when using the scanner for regular document management routines as well as when using latest "ScanSnap Manager for fi Series scanners" software to accomplish individual ad hoc tasks. Building on and incorporating the market-proven paper protection mechanisms of previous fi-series scanners, the fi-7160 introduces an additional market innovation for safeguarding any paper documents. By listening to the audible sound of paper movements, intelligent Sonic Paper Protection automatically suspends paper feeding if an irregular noise is detected. This advanced Paper Protection feature reliably reduces the risk of damaging documents during scanning. The fi-7160 is equipped with a "Skew Reducer" to maintain the straight alignment of paper feeding. Particularly valuable for mixed document batches containing small format documents or thin paper sheets, this function reduces the physical skew of documents throughout the paper path. Even the most untidy batches are given special treatment sheet-by-sheet, which ensures total coverage for every scan: no lost data on the edges or in the corners, no more rescans. The fi-7160 brings industry leading mixed batch scanning capabilities to the desktop with a design that allows for a record breaking mixed batch feeding range from 27 - 413 g/m², freeing the user from most paper weight related pre-sorting requirements. The fi-7160 makes use of an ultrasonic sensor that accurately detects errors where two or more sheets are fed through the scanner at once. Multifeed detection works reliably when scanning mixed batches of documents with different paper weights and sizes. When multifeed is detected, the user is instantly alerted and can continue capturing all relevant sheets and pages without losing relevant information. Alternatively, using PaperStream Capture for batch scanning jobs will allow for ex post correction without any interruption during the scanning process. Automatic detection enables the fi-7160 to create image output formats in colour or monochrome, based on the actual document content. There is no need to change settings manually. If you need your documents to show evidence of having been scanned, the optional imprinter will "stamp" the reverse side of your documents additionally providing a cross-reference from your digital files. The fi-7160 comes equipped with a centralised administration feature that system administrators can use to manage the installation and operation of multiple image scanners and network scanners from one location. Important business information held on paper documents flows freely through the fi-7160's paper feeder into your organisation's backbone.